Cleveland needs a new co-main event. Heavyweight contender Ben Rothwell has been forced out of his upcoming fight with former champion Fabricio Werdum after suffering a knee injury in training. Rothwell vs. Werdum was expected to co-headline the upcoming UFC 203 card in Cleveland with the heavyweight title bout between Stipe Miocic and Alistair Overeem serving as the main event. Sources close to the situation confirmed Rothwell's exit to FOX Sports on Thursday following an initial report by MMAJunkie. UFC officials have made no announcement about the change to the card or a potential replacement for Rothwell at this time. 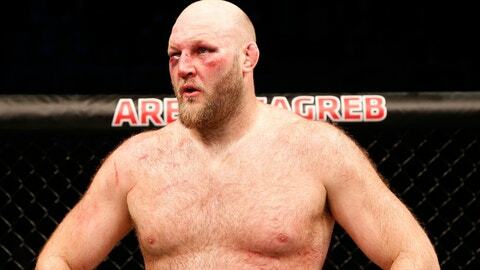 Rothwell was returning to action for the first time since suffering a unanimous decision loss to former champion Junior dos Santos in April, which put an end to his four fight win streak. Rothwell will have to wait until his knee is heeled to resume his pursuit of the UFC title while Werdum is left without an opponent as he also looks to rebound after losing the heavyweight title to Miocic back in May. Werdum is expected to stay on the card with a new opponent with a search likely underway to find a new opponent so he can remain on the Sept. 10 card. UFC 203 takes place at the Quicken Loans Arena in Cleveland as the promotion puts on a card in the city for the first time in history.